Monday, April 16, 2018 Milly's Rt Ch title Milly achieved her Retrieving Trial Champion title on the Sunday retrieving trial at the beautiful Blue Mountains. So, she is now officially Rt Ch Wrangham Jane Eyre, but known to us, as before, as Milly Mook. Monday, September 18, 2017 Milly's pups Milly and pups are doing well, and they bring us lots of love, joy and excitement (despite the pees and poos). Sunday, October 16, 2016 Milly has achieved her first All Age First Place Having just achieved her AARD (All Age Retrieving Trial Dog) title 2 weeks ago, at the weekend Milly, our English Springer Spaniel, came first in the All Age retrieving trial dog stake on Saturday. 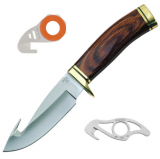 We endeavour to bring quality knives from reputable manufacturers from around the world. We also source quality custom handmade knives, most of which are one-off designs and therefore rare and collectable. All of our knives are in stock here in Sydney, Australia, unless the knife is stated to be for "Special Order" or out of stock. Tip for caring for your knives: Keep your knives out of their leather sheaths for storage as the natural oil from the leather sheath could cause the knife blade to rust or tarnish over time. Please also oil your knife often. 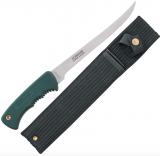 Please note that Sporting Outback Supplies have a strict policy only to sell knives to persons over the age of 18 years, and that by ordering and purchasing knives from Sporting Outback Supplies you represent that you are over the age of 18 years.